In a far-flung corner of China’s Xinjiang province lies a corridor that has been drawing adventurers, explorers and ancient traders for millennia. Bridging the gap between Pakistan and China, skirting the borders of Afghanistan and Tajikistan, the fabled Karakoram Highway begins at the edge of the Uyghur city of Kashgar and rises through the Pamir Mountains to be the highest major road on the entire planet. Once part of the historic Silk Road, now it acts as a thoroughfare for Pakistani importers and exporters sending goods from their homeland into the vastness of Western China. Our journey to Kashgar was made with the intention of exploring the Karakoram Highway and trekking amongst its colossal mountains. It was to be our last adventure in China before tackling Central Asia, and we couldn’t be more excited. Knowing that it was very difficult to do this independently, we teamed up with the reputable tour company Old Road Tours to organise our permits, transport and a guide, and sat down with them to plan our route. The pearls of the Karakoram Highway are the glass-like Karakul Lake and the imposing mountain of Mutzagh Ata. Studying a map with the owner Abdul Wahab, we drew a line from a lakeside village to the base camp of Mutzagh Ata and decided this three-day trek would be our ultimate mission. With Old Road Tours taking care of the logistics, all we had to do was stock up on food and water and prepare ourselves mentally for the challenge. Monday morning arrived and we met our affable and experienced guide Musa at the Seman Hotel, which doubled as both our accommodation and the headquarters for Old Road Tours. We felt an instant connection with Musa and couldn’t wait to get out into the rugged landscapes of the Karakoram with him. We waved goodbye to civilisation and got on the road. 45 minutes from Kashgar we stopped at the small village of Upal to check out their local market. We wandered through the dusty bazaar eyeing off the amazing variety of items for sale. From meat and produce to kitchen utensils and clothing, it seemed almost anything could be bought at the Upal market. At the back of the grounds there was a small yet bustling livestock market with cows, goats, sheep and yaks being exchanged in rapid negotiations. While not as large as the Kashgar livestock bazaar, the Upal market was every bit as exciting and authentic as one could hope. Deciding against buying a fat-tailed sheep, we jumped back in the van and continued our journey. The Karakoram Highway quickly turned into a quagmire of construction, with loaders and graders standing idle amongst the potholed mess. The Chinese government obviously has big ambitions for the future of this high-alpine motorway, but for now over 100km of it is hideous and bone crunching. Unfortunately the scarring and litter left behind by the construction crews truly destroys the stark beauty of the surroundings. Tourism in China has seen intense development, and few places can escape this onslaught. Tiger Leaping Gorge is one place that has survived, and we pray the Karakoram Highway can do the same. One can only hope that when work has finished on the highway that the rehabilitation of the area will be swift and intense. Despite the tragic scenic introduction, arriving at Karakul Lake was every bit as impressive as we could have hoped. Mutzagh Ata towered ahead of us like a looming white giant and rounding a corner the glistening azure of the lake contrasted brilliantly against a barren landscape. We jumped out at a small village on the shores of Karakul Lake and checked into our homestay. A lovely Kyrgyz lady welcomed us with yak milk tea and bread and made us feel at home in her cozy stone dwelling. Not wanting to waste a minute of the gorgeous day, Alesha and I went for a rambling hike to soak up the pristine vistas. Before too long the sun began to set and the chill of the evening kicked in. We gorged ourselves on a huge vegetarian meal prepared by our host and headed into our own private concrete yurt for the night. A canvas yurt on the edge of Karakul Lake. Yaks cross a footbridge at Karakul Lake. Stunning colours with Mutzagh Ata overlooking Karakul Lake. Sneaking out as the sun was rising we were amazed to discover that not a single cloud was in the crisp morning sky. Before us lay Karakul Lake, as still as a frozen pond, with the summit of Mutzagh Ata piercing the sky at 7546m above sea level. We had heard the tale of a poor Japanese traveller who had visited this exact location nine times and still had not seen the summit. Today on our first visit we were graced with its extraordinary presence. Luck was definitely on our side. Musa rose shortly after us and we ate a light but delicious breakfast with our host. Bidding farewell, we began our trek by circumnavigating Karakul Lake. At every point Mutzagh Ata watched over us, its permanently snow-capped silhouette glowing brighter and brighter as the hours passed. It only took a few hours before we wandered through our second Kyrgyz village, and local children came running from hidden corners to yell and greet us. We threw high-5s and snapped some photos before pushing on towards higher ground. Moving further and further from Karakul Lake we climbed up a steep and testing hill and caught our first glimpse of the mighty glacier that scarred the valleys of Mutzagh Ata. With this as our inspiration we dragged our exhausted bodies into a tiny village and introduced ourselves to another local family. The mother of the house was away but their 14-year-old daughter ushered us inside and prepared a delicious dinner. Eventually the father returned from working in the fields and joined us for some milk tea and joking conversation. Rolling out some blankets on the floor of their stone hut, we nuzzled up by the fire and slept in the company of the family. The stone house we slept in on our second night. The early morning sun peaked through the cracks in the ceiling and we packed our bags ready for departure. We snacked on bread and fruit and said goodbye to our generous hosts. The toe of the glacier seemed to be within arm’s reach but we knew that many hours of intense scrambling lay before us and the groaning ice. With every aching step we inched our way towards the frozen river, traversing over loose rocks and steep crevasses. Our movements slowed as we crept into thinner oxygen. With each minor advancement we had to dig deep to find more willpower. The glacier of Mutzagh Ata urged us forward, with its tumbling ice spilling down the ravine in glorious fashion. Nothing could motivate us more than its commanding existence. Each minute passed in breathless manner and we finally reached the toe of the glacier. Dropping our backpacks on the solid earth, Musa, Alesha and I walked gingerly across the creaking ice. Already 100m deep we could hear the fast flowing melt-water beneath us. Musa and I moved down to the glacial river and scooped handfuls of refreshing water to our mouths. There is very little that could make us feel so infinitesimal as being hidden in a crevice of a mighty glacier. The glacier of Mutzagh Ata. We spent over two hours just admiring our location on a piece of frozen ice that has forged the environment around us over thousands of years. Eventually Musa suggested we make our way towards the base camp and we reluctantly trudged on. Not even an hour’s trek was required to reach the now abandoned base camp. During the months of June and July it is supposedly a hive of activity. Now at the end of August the only sign of life that remained was the abundance of litter left over from the careless climbers. Feeling anti-climatic, we quickly moved out of the trash-filled epicentre and down the valley towards our next village. It is truly hard to comprehend the unique location that these Kyrgyz villagers call home. The children run around in clothes and equipment donated from previous climbers, which only increases their desire to climb the peak that soars above them. A few kilometres down the valley the Karakoram Highway continues its journey between China and Pakistan. To a Westerner every direction screams the appeal of addictive exploration. To them, this is their backyard. A young family and their canvas yurt was to be our final home for the trek and we quickly became acquainted with the children and neighbours. One adolescent kid convinced me to ride his half-broken motorcycle around the quaint village while his parents watched on with cautious apprehension. The afternoon passed by in relaxed fashion and we sat on a stone and watched the yaks graze on the alpine grass. Another delectable dinner was given to us from our new hosts and we retired early as the stars above sparkled brightly. Definitely not a bad place to call home. Jazza making sure his motorbike skills haven’t become rusty. Only a short three hour hike awaited us on our final day, and even though we tried our best to enjoy a sleep-in, the desire to witness one last sunrise from the base of Mutzagh Ata was too tempting. We crawled out of the warmness of the yurt and dashed to a highpoint to watch the dawn. As can be expected, we were not disappointed. Returning to the home we packed our bags, ate some bread and nuts for breakfast and trekked down towards the Karakoram Highway. Even with our lungs aching and our legs throbbing, we couldn’t help but stare back at Mutzagh Ata as we made our way back to the road that we had waited years to travel down. The last few kilometres seemed to drag on as we struggled to reach our waiting car. It was a mix of tiredness and reluctance to leave the mountainous environment that had been our home for three days. But we knew it had to eventually come to an end, and with winter approaching and Central Asia calling our names, we were ready to start planning the next journey. Musa walked next to us and asked if everything had been as we hoped. Having wanted to trek along the Karakoram Highway since as long as we could remember, there was always a fear that it may not have lived up to the expectations. Luckily for us, this was not the case. The hike from Karakul Lake to Mutzagh Ata had surpassed all we could have anticipated. With the mountains towering above us and the pale blue sky glowing in all directions, we were completely satisfied. Chances are we will never return to this part of the world, but one thing for sure is that it will always remain in our memories as one of our fondest adventures. The sun rises over Mutzagh Ata. Our host on the final night prepares our dinner. Our trekking tour of the Karakoram Highway was done with the support of Old Road Tours. All thoughts and opinions are of course our own. Excellent inspiration! Heading to Pakistan and then the KKH this year after a wonderful time last year in Tajikistan and Kyrgyzstan on the Pamir Hway (thanks for your blog posts on that too- they were a great resource for my trip). PS- Pakistan on your itinerary any time soon? Thanks for the amazing blog! Would you say the Karakoram is more scenic than the Pamir Highway? I only have time for one on my next trip. Hey Alesha and Jarryd, so glad I found this site and especially this particular post. Great photos, inspiring me to just grab my passport and go! I was also looking to go on the same trek with Old Road Tours – do you happen to still remember how much they charged for this 5-day trek? Great photos and awesome sceneries! I’ve always wanted to travel via the Karakoram Highway, too, and this just makes me wanting to do that more badly. Have to make time for that someday! Thanks for this! WOW, some photos and places make you ache inside.. a quiver, a yearning, a desire so strong. Your photos brought me here.. definitely a place I need to visit. It was on my hit list before, but it may have gone up a notch or two or three after seeing these. I’ve been to China twice before.. going a 3rd time in October ( after Mongolia), visiting the area around Xining ( Zhangye Danxia, Jiuyugauan, Dunhuang, Qinghai lake) before going into Tibet. Hopefully I can get my 10 year visa and I’ll be going to Karakoram next time I visit China after this. 🙂 Thanks for sharing!! Thanks for the great info. We will be heading there in a couple of weeks and your article only made me more excited to go! Incredible pictures and great writing. Xinjiang is the next region in China that I’d like to explore. Those blue skies are calling to me! Thanks so much Elen. Stoked to hear you are enjoying our adventure and posts. Hey guys, first time I’ve seen your website but I absolutely LOVE these photos! 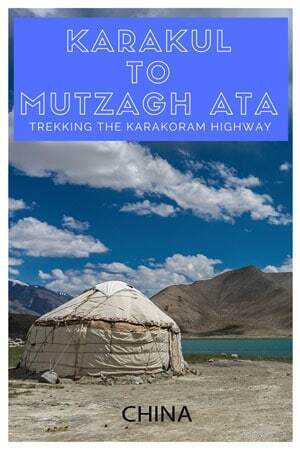 I was just on the Karakoram Highway last month and had a blast hiking around Karakul and up to Muztaghata base camp. I’ll actually be publishing a couple videos of the trip later this month so I hope you have a chance to check it out. Stoked you stumbled across our site Josh, and glad you liked the photos. Will definitely check out your videos when they come out. Happy travels. Really polished writing and photos of yet another enticing journey dudes. As soon as I can hang my kayak paddle up I need to head up into the heady heights of some snow-capped mountains again.